Funny? Familiar? Scarring? Personally, I think this montage Marie Claire created is hilarious, but it's not entirely my point just now. Hearing clients say, “my hair is thinning” is a pretty normal thing these days. With mature clients, identifying female pattern hair is easier and totally normal. But, properly accessing what might be at the root of the issue is harder when you have a young person in your chair. It’s becoming more common too. Ever heard of “traumatic styling?” Well, it isn’t a syndrome we hairstylists get when we have to blow out someone who has super thick hair. No, it’s a real thing! “Scarring” , also known as cicatricial alopecia, is the loss of hair which is accompanied with scarring. 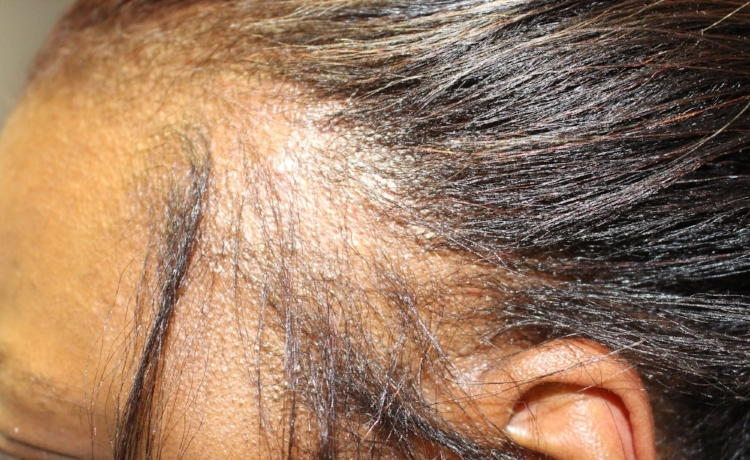 It can be caused by a diverse group of rare disorders that destroy the hair follicle, replace it with scar tissue, and cause permanent hair loss. Enter “traumatic heat styling” and it is something that effects more people than you might think. In fact, many of the young people I see and hear about, who are confused about hair loss or breakage, are suffering from the results of traumatic styling. We are in the golden age of hair dressing. There are more gizmos and gadgets, products, online tutorials, and young kids making appointments in the salon to get their hair colored. One would think professional services and maintenance would make hair feel and look healthy, but the opposite is true: we see more damage because of the frequency of use of hot tools and excessive coloring. 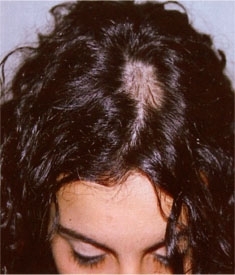 Central Centrifugal Cicatricial Alopecia, CCAA, is a very common form of scarring hair loss, caused by traumatic styling. Traumatic styling is considered to be chemical application, heat styling, and "pulling" hairstyles. Everyone’s hair is different. Some heads of hair tolerate this well and others will show signs of hair loss. If the hair is already fine and weakened, this kind of styling will make it worse. You’ll notice the severity of CCAA on the crown or the vortex of the scalp, and it may gradually expand to other areas of the head. Along with this loss, sufferers may have itchy and sore scalps, show redness and tenderness. When hair is severely damaged, it takes time to repair it. In my salon, we have used Olaplex with great results to protect the hair, Zenagen Evolve for breakage (treatment & conditioner), and the Rene Furterer Absolute Keratine line. And we aren’t afraid to tell clients to style differently – to style a little less. A low maintenance routine can be really hard for some people with challenging hair, or those who want to be blonde, but you’ll see and feel a difference in the health of your hair and scalp if you cut out some of the heat and constant styling. So, what do you need to know if you heat style or color? Take a break from styling - go natural as often as you can. Use heat styling protection products. Use wide-tooth combs. Be gentle on your hair when wet combing. Deep conditioner is a must! I love Rene Furterer Tonucia Mask for strengthening weakened hair and Absolute Keratine if you have color damage. These will improve your hair. If you use a flat iron use low heat and only leave on for a second or two. Don’t make multiple passes over the hair. Go easy on the chemicals. Get your hair done less frequently and make sure you are using gentle color. Share with your stylist that you’re trying to avoid traumatic styling and hair loss. If you are a more mature person, your hair is weaker than younger hair, so stay away from color as long as you can.